February 8, 2019 By Allyson 21 Comments This post may contain affiliate links. Read my disclosure policy. Valentine’s Day Chocolate M&M Popcorn is going to be the star of your Valentine’s Day Party! Only THREE ingredients and only minutes to toss together! Valentine’s desserts can be so easy to make and so delicious! This year we are servings SLOW COOKER LAVA CAKE, PINK OMBRE PANCAKES for breakfast, and STRAWBERRY COCONUT COCKTAILS! 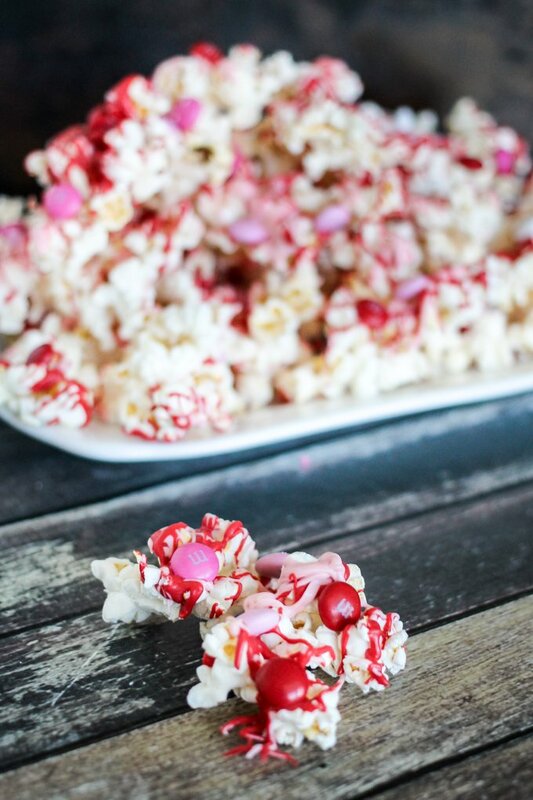 Y’all are going to LOVE this Valentine’s Day Chocolate M&M Popcorn! It’s a salty sweet mix of kettle corn, chocolate, and M&M’s…what’s not to like? It only has THREE ingredients, and you can whip it up in just a few minutes, then you let it set, and voila – done! I found the Valentine colored M&M’s at the grocery store in their holiday aisle, but you could really use any for this recipe. I like the pink, red, and white mix to keep with the Valentine’s theme, but you don’t need to get too caught up on that if you can’t find them. As for the chocolate, I just used candy melts from Hobby Lobby, but I think they also carry them at craft stores and probably even big box stores like Walmart. You can also make your life easier by just ordering them off Amazon! I used kettle corn popcorn, which you can find in any grocery store. The trick to this recipe is to use KETTLE CORN! It really adds a nice touch to the flavor combination, so trust me on this one. The sweet and salty combo pairs perfectly with the chocolate and M&M’s. I’ve made this popcorn countless times using kettle corn, and people always ask me for the recipe; they can never believe how simple it is either. Check out the easy how-to video below for proof. Pop the kettle corn and spread it out on a baking sheet. Melt the chocolates, then drizzle them over the top of the popcorn. Sprinkle the M&M’s over the top of the chocolate. Pop it into the fridge and let the Valentine’s Day Chocolate M&M Popcorn set. Break it apart into pieces and serve. Use green and orange chocolate or rainbow chocolate and serve this for St. Patricks day. Fourth of the July? Try red white and blue chocolate and M&M’s for America’s birthday. Need a Halloween Party Treat? Use yellow, orange, and black chocolates and M&M’s for a spooky take on this chocolate popcorn. You could even add candy eyes! 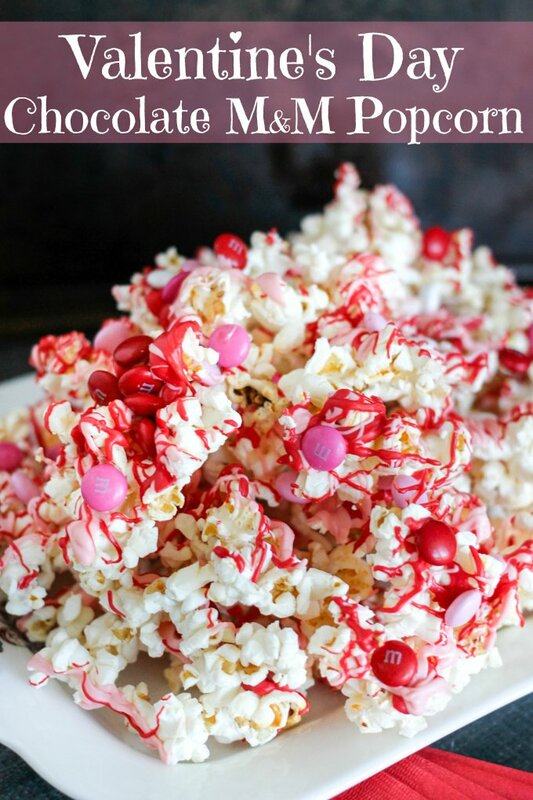 Valentine's Day Chocolate M&M Popcorn is going to be the star of your Valentine's Day Party! Only THREE ingredients and only minutes to toss together! 1. Melt candy melts according to package directions, set aside. 2. Spread kettle corn onto a parchment covered baking sheet. 3. 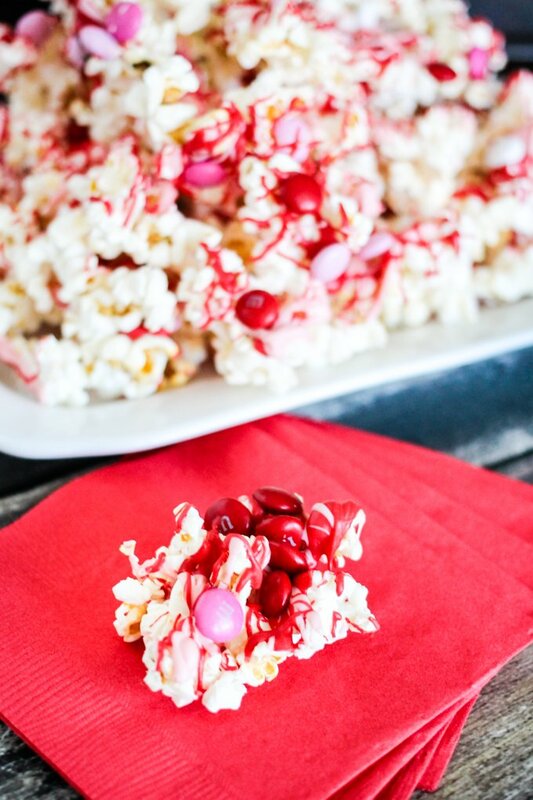 Drizzle red and pink chocolate all over the top of the popcorn, the more, the better! 4. Sprinkle M&M's all over the top of the chocolate. 5. Pop into the fridge and let it set for at least 2 hours. In a rush? Pop into the freezer for at least 45 minutes. 6. Break popcorn into pieces and serve! One of my favorites! So EASY. Such a fun recipe to make with the kids to take to a Valentine’s day party at school! This is the perfect treat for the upcoming holiday! Delish. This one is going to be hard to share! This is definitely my kind of treat! What a fun treat! I love that you can switch up the coloring for almost any holiday too! I love the sweet/salty combination! This looks ah-mazing!! Such an amazing snack idea! Love this popcorn M&M chocolate! Allyson, this is such a great innovation! This is such an easy and fun Valentine’s day snack! What a fun treat! My girls will love this. So much fun for valentines and so tasty! Wow! You’ve got my attention. I love popcorn and this is one fancy treat! A Valentine movie night with my childrens and this recipe and I will be the best mom on the planet! That looks wonderful! I love popcorn on its own, but it’s also a fantastic base for all sorts of sweet treats. This is so fun and yummy! My family would love it! Looks so delightful! So easy to make and crazy delicious, just perfect for the holiday! 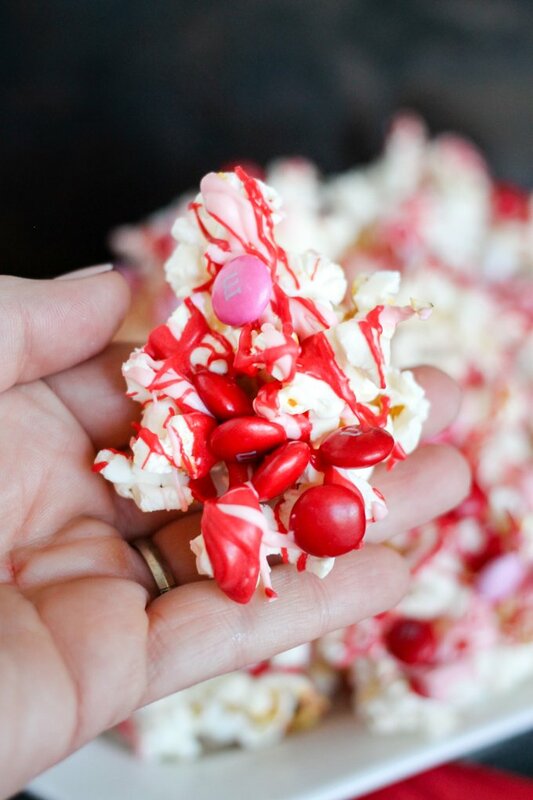 Loving this fun idea for popcorn! Perfect for a movie night! This is totally my kind of popcorn! Perfect for Valentine’s Day parties!